Often times it can be helpful to change the standardization interval on instruments to correspond with shift changes or other events that might be more convenient. When the instrument reaches the end of this standardization interval it will prompt the user to re-standardize the instrument before moving forward with measurements. 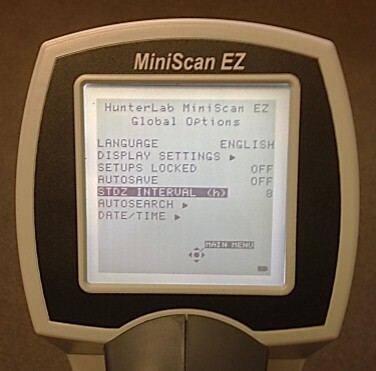 To change this setting on the MSEZ instrument navigate to Global Options from the main instrument menu. In the middle of the screen you should see STDZ Interval (h) with a value to the right of it. Scroll down to this option so that it is highlighted and then use the right and left arrows on the key pad to change this interval. The default for this option is usually 8 hours, and is what most users find to be appropriate.